Chances are, the answer is all of them. The key is consciously making inbound marketing decisions that bolster your mobile strategy. What Makes a Good Mobile Strategy? Let’s pause for a moment and reflect on what exactly makes a good mobile strategy. We can start by discussing what it’s not: it’s not a freestanding strategy. Rather, it’s a branch of what should be your larger marketing strategy. So step one is understanding the business strategy as a whole, and what you’re up against regarding the competition. Do you have an app? If so, your mobile strategy should map out how your app will ultimately benefit the user, and in what ways it will support the overall business objectives. Most importantly, document the strategy. No mobile strategy is a sound mobile strategy if the mission, goals, KPIs, scope, competitive advantage, etc. aren’t documented. You’ll want to be able to reference these for the sake of measuring success (or making improvements) as your strategy naturally evolves over time. All this talk about mobile strategy may have you wondering why mobile marketing, in general, is so important. Well, we’re glad you asked. 68% of US adults are smartphone users. As smartphones become more and more commonly used, particularly by those who are decision makers or have buying power, the more critical it is to your business success. Treat mobile marketing with high importance and as a unique channel. Keep in mind mobile marketing is not the same as inbound mobile marketing. So while you should certainly be marketing on or with a mobile device, you should also be tapping into the specific needs of your customer. So How Do I Inbound Market with Mobile? Now it’s time to talk about the five ways you can (and should) use inbound marketing in your mobile strategy. Nearly 20% of a smartphone users’ time on-phone is devoted to social media. Lucky for your mobile strategy, social media just so happens to be a key inbound marketing resource. Here you’ll make some of your most quickly connections with people interested in what you have to offer. By simply connecting with accounts who share your audience and posting engaging, highly relevant content, you’ll build a following of leads who have qualified themselves by voluntarily engaging with your social content. It has become the marketing rule of thumb: optimize EVERYTHING for mobile. This applies to blog posts, landing pages, images, and graphics. It’s safe to assume most things will look fine on desktop when designed on desktop, but this does not always translate to mobile. To ensure users are not immediately turned off by a horrible mobile experience (i.e. can’t read copy, can’t complete form fields, and other mobile mishaps), you have to make mobile the priority in all of your web content endeavors. This includes emails as well. Plain text emails will resize to the device, but HTML-based emails can look incredibly clunky in smartphone email clients. Keep text size large and avoid multiple columns in your HTML emails. To win the hearts and minds of mobile users, you’ll want to provide the best user experience as it pertains to your user’s context and intent while seeking answers. Knowing what your user’s intent is, will allow you to prioritize the content that they are looking for and cut down on friction that would be created if they had to search for it while they are on their mobile phones. A user on the go with a smartphone may want a store locator or phone number. Can they find one easily on your mobile site? Another user might even be in your store, looking for reviews on the lawnmower they’re considering. Can you help them? In some ways, this relates closely to the “optimize everything for mobile” mantra stated above, but in many respects, it’s its own rule of thumb (hehe). While you’ve created content that is friendly to a mobile viewing screen, it’s important to pay particular attention to elements on a web page that might inspire or require action. Interactive elements like forms or buttons should be designed to function smoothly in the context of a “fat finger” selector as opposed to the more streamlined mouse design of the desktop. A few tips: make sure buttons, and links are easily recognizable as such; let buttons stand alone on a page, make them big enough to easily select with a fingertip; keep form fields and other data collection sites brief and big enough to read. What better way to support your inbound strategy than through organic search? To bolster your mobile search ranking, you’ll want to ensure your entire site is mobile optimized. That means either having a separate mobile site or making your standard site fully mobile responsive, designed for the fat finger (see above) and easily readable on a small screen. In addition, due to some recent Google updates, you’ll want to disable any full-screen takeovers you may have running as a quick and easy way to capture data. Google has found these disruptive to the mobile browsing experience. And has begun to penalize sites that use this particular tactic. With these five tactics, you’ll be well on your way to making your mobile strategy a significant part of your overall marketing strategy. Not to mention, you’ll see an increase in both sales and leads when you get precise with your strategy. And as we move more and more in the direction of screen time on mobile, you’ll thank yourself for taking the time to make the mobile experience the most attractive possible in support of your inbound marketing efforts. Your customers will find you on the device that works best for them, and you’ll be equipped to respond accordingly. Everybody wins! You’re nearly an expert now…stay current on all things digital marketing. 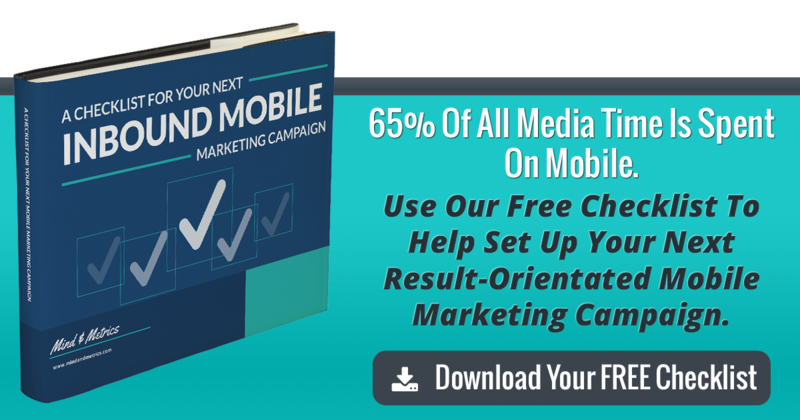 Have questions about how to tailor your mobile strategy to your inbound marketing objectives? Let us know!